Bamboo is an incredibly strong and flexible plant, but many people do not initially understand how bamboo can be used to make some of the softest, most comfortable pillows on the market. Neither a standard pillow stuffed with bamboo pieces nor a pillow formed from hard layers of bamboo, bamboo pillows are instead specially treated to become extremely pliant threads and then woven into one of the world’s most sustainable and hypo-allergenic textiles. Bamboo thrives without pesticides or chemical treatments, so all bamboo fabrics are naturally organic. As a hearty plant, bamboo contains natural elements which are anti-bacterial. Bamboo fabric absorbs sweat readily, making bamboo pillows naturally temperature controlled. 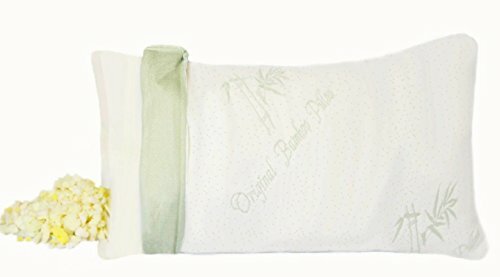 Bamboo pillows are recommended for people suffering from asthma or other respiratory ailments. Bamboo fabric is naturally breathable due to its unique construction of ultra-fine fibers. Bamboo is an environmentally sustainable product as it does not require irrigation and it grows far faster than cotton or other textile fibers. Bamboo pillows are also extremely comfortable and pleasant to the touch. With a neutral odor, bamboo pillows are ideal bedding material because they are naturally hypoallergenic, they repel dust mites, are resistant to mold and bacterial growth, and comfortably regulate body temperature by absorbing sweat while remaining very breathable. If you want to find out more about other bamboo products then check out these bamboo bed linen reviews. 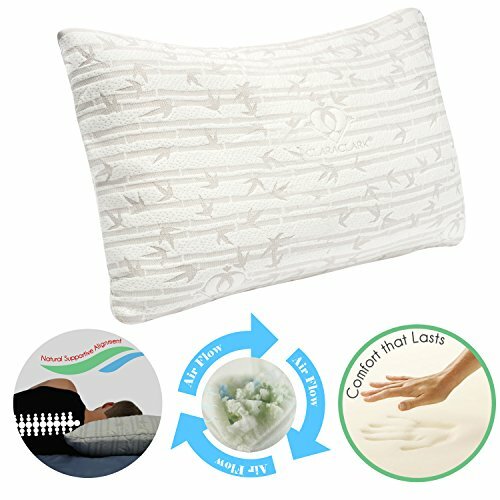 Miracle Bamboo Original Shredded Memory Foam Pillow Original Miracle Bamboo Pillow can be folded in half for a firm, supportive pillow. Lay it flat for a standard medium, supportive pillow, or stand it up on its side for extra soft, fluffy support. 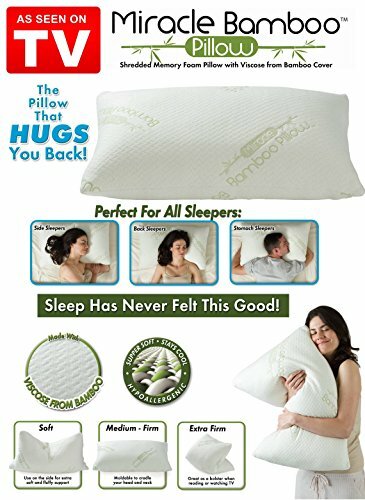 Using a special proprietary blend of vicrose made from bamboo, polyester and Lycra, the Snuggle-Pedic memory pillow is extremely comfortable and is guaranteed to absorb sweat and regulate temperature all night long. Made in the United States, the Snuggle-Pedic uses a special “memory foam” design to never lose its shape and become flat. Certified to be environmentally friendly, the Snuggle-Pedic is rugged enough to be cleaned in a washing machine. The adjustable pillow from Coop Home Goods features a special cover with a 40% bamboo, 60% polyester blend for enhanced breathability and durability. Made entirely in the United States, the pillow uses patent pending memory foam technology that can be tailored to suit any sleep position eneds. 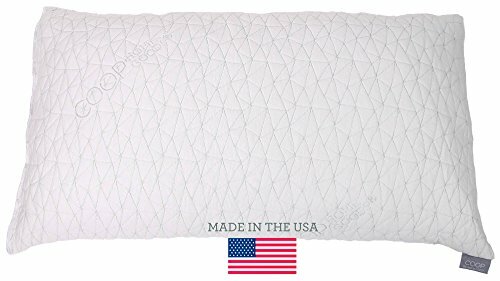 Machine washable and with a five-year warranty, the Coop Home Goods bamboo shredded memory foam pillow is certified as CertiPUR-US for content and emissions. Using a proprietary blend of 100% CertiPur-US memory foams, the Five Diamond pillow will automatically adjust to provide a more comfortable and relaxing sleep experience. Durable enough to be machine washed, the Five Diamond pillow cover is made from a 60/40 polyester/bamboo fabric for enhanced breathability and hypo-allergenic temperature regulation. Firm enough to gently cradle the head and neck but soft enough for maximum comfort, the Five Diamond comes with a 30-day no questions asked return policy. Made from very firm, slip-resistant bamboo fibers, the Brentwood Home Zuma is the ultimate therapeutic pillow for sleepers dealing with snoring issues, respiratory ailments, or poor circulation. The gentle slope of the Brentwood Home Zuma can be used for reading in bed or watching television or can be placed under the torso to help eliminate issues with acid reflux. 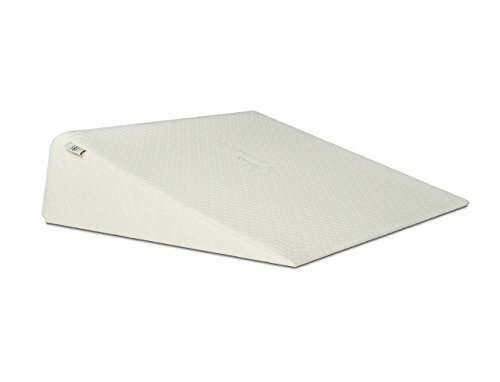 The hypoallergenic design is ideal for sleepers with allergy problems and the Brentwood Home Zuma can also be placed under the legs to provide relief while improving circulation. 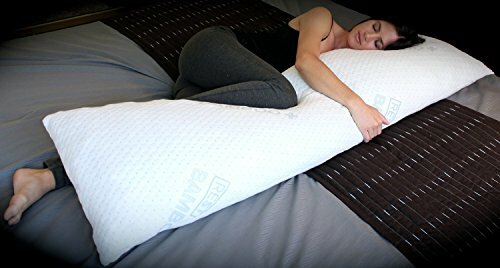 The title says it all, as the REST Full Body pillow contains a special memory foam technology that contours to the body, providing a more restful and comfortable sleeping experience. With a breathable cover composed of 60/40 polyester/bamboo, nighttime temperatures are regulated, allowing for a very cooling rest. The REST Full Body is also machine washable for added longevity. With a specially engineered scrolling design, the My Stunning Abode Memory Foam Neck Pillow is ideal for providing enhanced support to the neck while the luxury memory foam core provides a comfortably soft pillow area for the head. Made from 40% eco-friendly bamboo fibers, the My Stunning Abode Memory Foam Neck Pillow stays cool throughout the night for a more refreshing and relaxing sleep experience. Naturally hypo allergenic and resistant to dust bites and bacteria, the My Stunning Abode Memory Foam Neck Pillow is the optimal balance between firmness and softness. 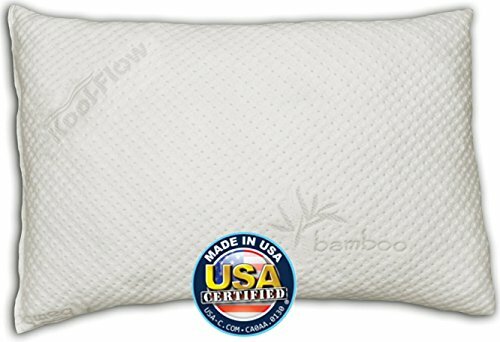 One of the first bamboo pillows on the American market, the Miracle Bamboo Original Shredded Memory Foam Pillow is uniquely designed to serve equally well as a head or body pillow. 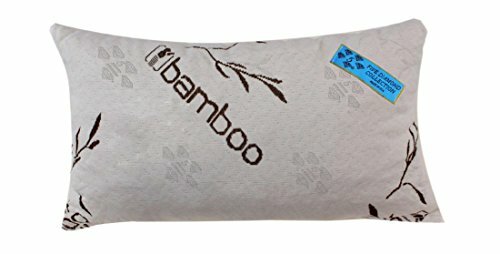 Using a microbe and dust mite resistant bamboo cover, the Miracle Bamboo pillow is ideal for individuals with respiratory ailments or who suffer from snoring. The Miracle Bamboo is filled with special memory foam strips that provide gentle cushioning that automatically adjusts to the body’s contours. With a solid, stay-put design, the Clara Clark Rayon made from Shredded Memory Foam Pillow features an eco-friendly 40% bamboo and 60% microfiber zippered cover to improve breathability while resisting bacteria and dust mites. The interior of the Clara Clark pillow is 100% memory foam that is durable enough to be machine washed and dried on low heat. 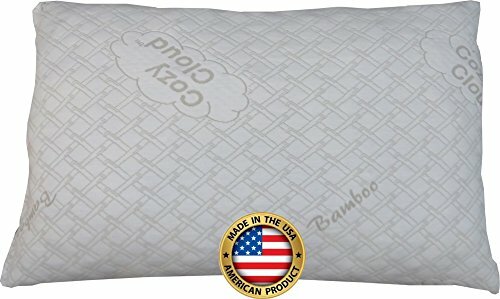 With a 10-year satisfaction guaranteed warranty, the CozyCloud Bamboo Shredded Memory Foam Pillow is filled with 100% CertiPUR-US memory foam that contains no toxins or ozone depleting chemicals. 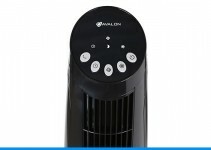 The patented Air-Vent cover is made from a special blend of bamboo and polyester to improve temperature regulation. Bamboo has been shown to provide relief for allergy suffers and individuals with respiratory difficulties, including snoring. The high-density memory foam filling is both very soft and comfortable and works to provide a cool, refreshing sleep experience. A customizable pillow from Original Bamboo, the Adjustable Shredded Memory Foam Bamboo Pillow contains a zippered liner to allow sleepers to adjust the amount of memory foam for enhanced comfort. The proprietary memory foam filling can adjust to the body’s contours for a uniquely personalized sleep experience. 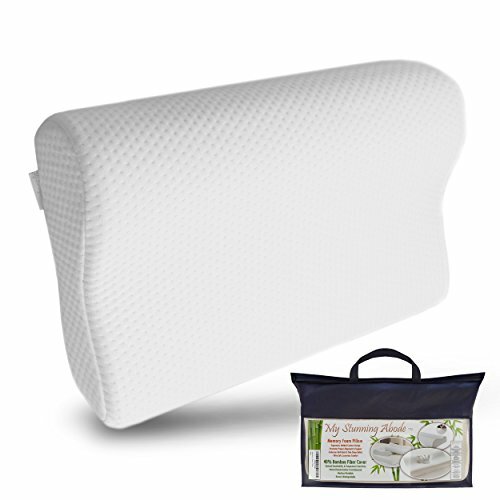 The Adjustable Shredded Memory Foam Bamboo Pillow comes with a special bag to store extra memory foam. 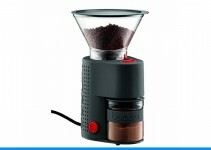 Safe enough for machine washing and drying on low heat.